but, just in case, we've put together a double-whammy for you this morning! Since 5/21/11 is supposed to be the end of the world, could you send us the Sunday Comments issue of Forgotten Hits a couple of days early? You know ... just in case they're right. 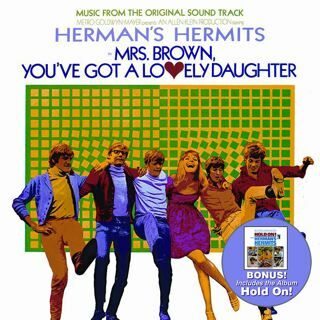 This week ABKCO Records releases Mrs. Brown, You’ve Got A Lovely Daughter (Music From The Original Soundtrack), from the 1968 film starring Herman’s Hermits. The album includes the hit title track as well as the smash hit “There’s A Kind of Hush” and seven more songs from the film. The film starred the group along with veteran actor Stanley Holloway who had earlier been featured in My Fair Lady. ABKCO is including the entire soundtrack from Hold On!, the band’s previous film, originally released in 1966, as a bonus with Mrs. Brown, You’ve Got A Lovely Daughter. It includes the hits “Leaning On The Lamp Post,” and “A Must To Avoid.” Going back to original source tapes, the albums have been painstakingly remastered for this release. The soundtracks are offered together as a specially priced physical release and are available individually from digital retailers at the same time both films have been released on DVD from the Warner Archive Collection. Herman’s Hermits (Peter Noone, Keith Hopwood, Karl Green, Derek Leckenby and Barry Whitwam) were at the forefront of the “British Invasion” and were the top selling pop act in the U.S. in 1965, even beating out the Beatles. The original single of “Mrs. Brown You’ve Got A Lovely Daughter” was Grammy-nominated that same year. Noone continues to perform the Herman’s Hermits repertoire and is on a U.S. tour now continuing through the summer months. The original tracks for both Mrs. Brown You’ve Got A Lovely Daughter and Hold On! were produced by legendary British producer Mickie Most who also produced the Animals, The Yardbirds, Donovan and many others. Of special note is the fact that almost all of the Mrs. Brown ... soundtrack selections were arranged by John Paul Jones who would go on to be a founding member of Led Zeppelin. Four of the Mrs. Brown tracks were written by Graham Gouldman, who had been a source of hit songs for not only Herman’s Hermits but also for The Yardbirds, The Hollies, Wayne Fontana, Jeff Beck and others before he formed 10cc. Enigmatic American songwriter P.F. Sloan wrote (or co-wrote) four of the Hold On! soundtrack selections including the title song. In other "new release" news, Franke and the Knockouts' Greatest Hits CD is finally coming out! ONE OF THE GREAT LOST ‘80S BANDS HAS BEEN FOUND! To others, FRANKE & THE KNOCKOUTS was that other New Jersey band that boasted Tico Torres as its drummer -- right before he joined Bon Jovi en route to superstardom. And then there are those who can’t shake that pop-perfect Top 10 smash “Sweetheart” from their brains, even though they might not remember the artist behind that and several other Top 40 blue-eyed soul hits from the early 1980s. One of the greatest “lost ‘80s” bands has been found! More than a decade since their radio rockin’ blue-eyed soul music was available anywhere, FRANKE & THE KNOCKOUTS are back in a big way. To celebrate the 30th anniversary of “Sweetheart,” the band’s first hit record, Friday Music is releasing the newly remastered ultimate hits collection, THE BEST OF FRANKE & THE KNOCKOUTS: SWEETHEART – ANNIVERSARY EDITION, on CD and digital download. As a special bonus for all the collectors who’ve been clamoring for the entire catalogue for a generation, the band’s three “lost” albums, Franke & the Knockouts (1981), Below the Belt (1982) and Makin’ the Point (1984) – will be simultaneously available for the first time since their original vinyl issue, also newly remastered, in digital-only format. All four albums are being released May 24, 2011 on Friday Music. 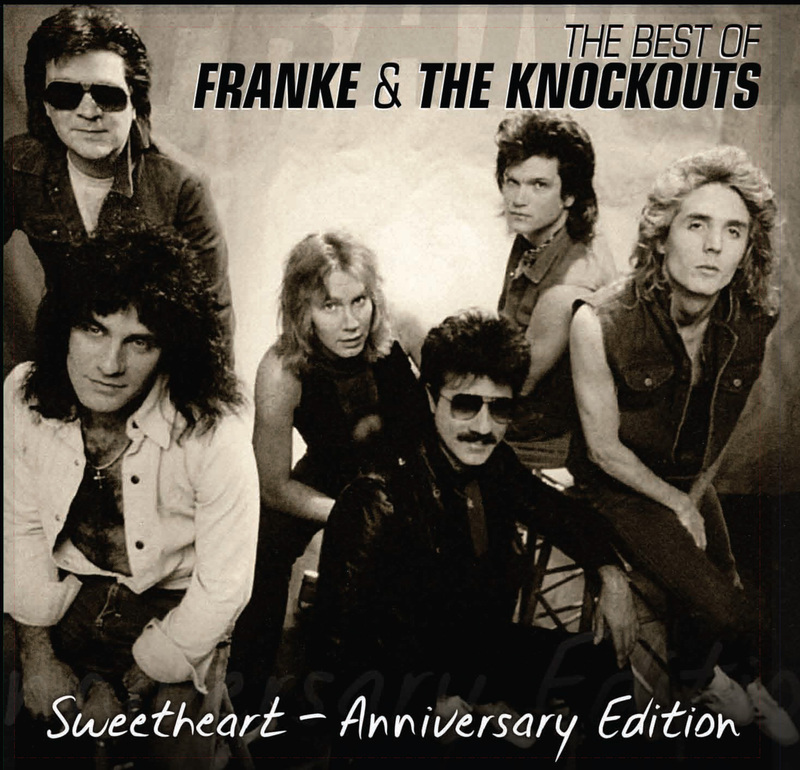 THE BEST OF FRANKE & THE KNOCKOUTS features 19 hit tracks including all of the band’s classics such as their unforgettable Top 40 hits “Sweetheart,” “You’re My Girl” and “(Without You) Not Another Lonely Night.” It also features two bonus tracks, the original demo version of "Hungry Eyes," which Previte originally wrote and recorded for Franke & the Knockouts before it wound up becoming a Dirty Dancing soundtrack smash for Eric Carmen, and the previously unreleased power ballad "Beat Of A Broken Heart," written and recorded for the Dirty Dancing sequel, Havana Nights. The artist owned and authorized disc also includes new liner notes by Previte, unissued photos, and original artwork elements not seen in years. Previte is donating his portion of the proceeds to the Patrick Swayze Pancreas Cancer Research Fund at Stanford Cancer Center, in memory of his courageous Dirty Dancing friend. we got to thinking about another classic "mining" song. #1 Smash eight years later with his ridiculously infectious pop piece "Escape (The Pina Colada Song)" ... which you still hear at least a couple of times a day on virtually EVERY radio station. But you hardly EVER hear "Timothy" anymore ...so, in our own kind of Miner Twin-Spin, we'll feature it today as a Forgotten Hits bonus track! Any idea where it was recorded? I mean, type of building? Auditorium? You know who the drummer was? The reason I asked (e-mailed Joe, too) about "Walk A Mile In My Shoes", is that on a Toshiba - EMI Japan CD, I heard a run-on ending, with the drummer. Nothing exciting, but strange. But it LOOKS like, since I have a slightly shorter version, when it was remastered in 2002, I guess the let the tape roll. I thought I found a rare gem! LOL! Great song; wish it was recorded with a bit more professionalism! I really appreciate that you posted my Coke jingle plea. Have you received any feedback? I know that no one has contacted me about it or about me sharing those nearly 500 jingles. Absolutely perfect! Wonderful, thank you, thank you very much ... it has no mistake, you are gold American boys! You made me really very, very happy ... all three songs are perfectly identified. I read your email in the morning, you wrote there that you were able to identify three of the songs, but there on the Forgotten Hits web page was nothing, so I didn't understand you. This problem was in time moving ... I have ten hours less than you! My greatest thanks to Tim Kiley, Scott Schultz and Mc Henry for identifying. I believe maybe we shall find still some ones more. >>>Just wonderin' if anyone out there has an mp3 of the song by former major leaguer Tony Conigliaro called Little Red Scooter???? I tried lookin' for it but no luck ... Thanks! Someone asked for this song. If he doesn't have it already thought I would pass it along. Keep up the nice job you are doing Kent. Thank you very much! And keep up the good work with Forgotten Hits. Tony Conigliaro actually released several 45's in the 60's. Here are the songs I have. I am missing one. The copy of "Little Red Scooter" on You Tube is actually pretty good. You remember correctly ... we used to watch it all the time, too. Hosted by Kenny Rogers and The First Edition, I believe it was broadcast out of Canada ... but they had some pretty good musical guests on there as I recall. (This was Kenny's "in-between" period ... the hits for The First Edition had pretty much stopped by now and he was still a few years away from relaunching his career into the stratosphere as a solo country artist.) I think it had a steamboat setting, too ... and was probably based on (or took its name from) the popular Creedence Clearwater Revival song "Proud Mary" aka "Rollin' On The River". Thanks to Clark from Lincoln for more info on the Battle Of The Bands on WCFL. And also for the interesting stories, especially about Ron Riley's Sunday Preview show. One question for Clark - the WLS Sunday shows for a long time were taped, allowing the jocks one day a week off, even though they they would still be heard on Sunday, it wasn't live. I think maybe the only exceptions might have been Clark Weber's morning show, for Sunday mornings would be religious or public affair shows, and the East of Midnight show, for at the time WLS signed off Sunday night / Monday morning. Everyone else had a taped Sunday show. I was wondering when the taped Sunday shows stopped. It would seem odd on the clip you played of Ron Riley introducing a song as the wrong one was being played, that if it was taped they could not have gone back and "fixed" it before it aired. I thought John Rook had stepped in at some point in 1967. But apparently the taped Sunday shows must have continued for a short while into the Rook era. Any idea when they stopped? Boy, that question taxes my brain. My Saturday morning show was live. I’ve forwarded this question on to Ron Riley ... however I believe that all of the Sunday night shows were taped on Friday or Saturday. Once in a great while Art Roberts would do his Sunday night “Hootey Sapperticker” folk music show live. The station did go off the air at 11:59 Sunday night until 5 am on Monday morning for transmitter maintenance. It seems those 50 KW final amplifier tubes required a lot of care and feeding. The Sunday religious shows made huge amounts of money for LS as the airtime was very much in demand and the station got premium rates for it. That’s the reason they held on to those Sunday programs for so many years. PS: Ask John Rook if he continued the Sunday night taping because I believe it was still going on when I left in 1970. My favorite movie is "Lords of Flatbush" which "introduced" several actors including Perry King, Sylvester Stallone, Susan Blakely and pre-Fonzie prototype Henry Winkler. At the end of the movie during the wedding scene a beautiful ballad was sung. I never could find the song or who sang it nor could I find any soundtracks from the movie. Can you help? Definitely NOT one of MY favorite movies ... I remember all the hype when this first came out in theaters ... it was essentially a re-release trying to cash in on Sylvester Stallone's new-found fame and the fact that Henry Winkler was now a Pop Culture Icon for playing "The Fonz" on TV's "Happy Days". Enjoyed your comments on The Shangri-Las. Hoping that one day TJ Lubinsky can get them together to be on one of his shows. How about some comments on the late Chicago singer Major Lance. They have been featuring his song " Um Um Um" (if that is spelled correctly!!!) on a TV commercial. I think he had at least two or three hits in the sixties. I'm open to anything anyone might like to contribute in the way of Major Lance information. Elsewhere, it is written the song lyrics were changed to remove the "Hell"; eg "One Hell Of A Man" to "One Big, Big Man", or similar, because a version of The Battle Of New Orleans had a previous problems (objections) using the "Hell" word. Thought the 45 single was issued as such, tamed. But on his Singles collection, marketed by Collector's Choice Music, it contains the same common "Hell" version, with matching 45 single matrix number!! So, what was actually issued as the "hit"?Why was LP version changed? I mean, I guess, they had to get rid of the word "Hell"? Seems the single version contains that! Trying to track down both versions! I may have heard both!!! I've told you all before how disappointing it was a few months back to hear, during one of those "all request" shows, that the station in question DIDN'T have a copy of this song to fulfill a listener's request. Now that's just WRONG!!!!! A record that topped the charts for FIVE WEEKS?!?!? And has gone on to become a pop classic??? I swear, every day there seems to be some new obstacle preventing us from doing Forgotten Hits in a time-efficient manner! That means our scheduled "Helping Out Our Readers" page has to get bumped ... good thing we've already received a ton of comments from you guys on OTHER stuff to fill today's post! Has Groove Me by King Floyd been featured yet? How About Groovy Motions by the Fireballs? And here are a couple more tunes sure to make you groove! And here's one of my favorite groovy tunes ... and fitting with Summer just around the corner ... it's "Groovy Summertime" by Love Generation! In the early part of the week when you first started featuring "groovy" songs, one of the first records that I thought of was Bobby Rydell's 1960 recording of GROOVY TONIGHT, the flip side of SWAY. However, I checked this afternoon and it was on the national charts for just some two weeks peaking in the seventies I believe. Groovy Girl - The Waterproof Tinkertoy 1968. Top Ten in Milwaukee. Remember that lost gem? Good job this week ... I really enjoyed The Grooviest Week Ever. Thank you for the grooviest series ever ... kudos to our always groovy host! Just thought I'd share this with you, especially the "oldies" part, from this station in New Jersey. We actually removed the "Oldies" moniker a while back. While we do play some music from the 60's and 70's, we simply refer to ourselves as "The Local Station". Got this from Ron Smith's Book. I know you have a copy. I see your name on the back cover. 5/16/1966 = The Beach Boys release their "Pet Sounds" Album. WCBS-FM = Every hour they're playing a song about a pet, followed by a Beach Boys Hit. You have to admit, they come up with some unique ideas. My online column is Beach Boys Examiner, not California Examiner. I also have a Jan & Dean Examiner. In an interview with BBC 6 Music, Beach Boys mastermind Brian Wilson hinted that the group may reunite in the studio to celebrate their 50th anniversary. "I'm considering it," he said. According to Wilson, nothing is holding him back aside from a reluctance to reconnect with his old partners. "I just don't know if I want to be around those guys, you know? They're zany guys. They're crazy." Wilson has not collaborated with his former bandmates since he co-produced Stars and Stripes Volume One, a 1996 album featuring country versions of their hit songs. Though it remains to be seen whether or not Wilson will record new material with the band, the Beach Boys will be coming together to put the finishing touches on Smile, the band's never-released follow-up to their 1966 masterwork Pet Sounds. The group will be offering input on the album's track listing, which was never firmly established as the record was never completed as originally planned. 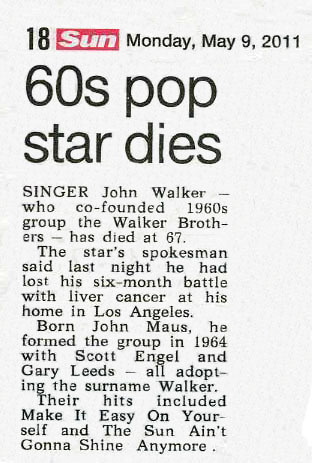 Sorry to say I had not read the weekend "Forgotten Hits" mega issue by the time I'd received this obit on John Walker from my London friend, George Van Win. 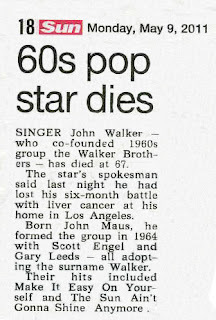 I thought you (and the readers) might be interested in what the UK papers had to say about John and The Walker Brothers. I never worked with John during the group's heyday, and, like a lot of others at the time, considered them an extension of the British invasion. I was aware of Scott (Engle) from several singles he'd recorded in the early 60's -- and one particular 45 had a picture sleeve -- so I knew he 'looked like' a star. Their two singles were favorites of mine at the time, particularly "The Sun Ain't Gonna Shine (Any More)." Great production, vocals, for sure -- but the success of the group was short lived. Years later, in May 2005, I was honored to be invited to emcee the Landmark Ceremony when the Wilson home in Hawthorne was officially designated a California Historic Landmark -- even though the home had been torn down years before for the Century Freeway! On that hot afternoon in Hawthorne, Brian, Alan, Dave Marks all performed, along with Billy Hinsche and a group he was working with at the time, Tripsetter. The Hawthorne High School Band performed a medley of Beach Boys classics and later -- at a reception and lunch -- The Honeys even did their classic "Be True To Your School" cheerleader segment -- singing to a Beach Boys tribute band, "The Beach Toys." Yes, you read that correctly, "The Beach Toys," complete with white pants, striped shirts and a bass player who was a dead ringer for a much younger Brian! The next night, at a separate event tied to the Dedication, various members of past Beach Boys touring groups performed, along with Dave Marks, Billy and a few others. Among the 'special guests,' was John Walker -- who not only looked great but sounded great, too. Watching him perform that evening you could not imagine him passing barely six years later. He seemed like a great guy -- passionate about his music, and eager to entertain the audience as he did that evening. Fast forward to this past Friday, May 13, I had the honor of 'hanging out' with my old friends, Mike Love, Bruce Johnston, and the Beach Boys band, at a benefit concert in Huntsville, AL. It was the first time I'd actually seen their show in over seven years although we had gotten together at an event on the roof of Capitol Records (June 2006) to celebrate the 40th Anniversary of "Pet Sounds," the album I was blessed to be at the 'mastering' of -- in the basement of the Capitol Records Tower some 40 years before! Just me, my hero, Brian, and the Capitol mastering engineer. None of us could have possibly imagined what we were witnessing at the time -- sitting on the cold linoleum floor of a small mastering room! During the course of last Friday's meeting with Mike, Bruce and band -- along with 'special guest' John Stamos -- I attempted to pick their brain as to any plans for a 50th Anniversary tour -- an 'official' one, that is! Bruce did not want to elaborate on it, but I got the distinct feeling that they may hold off until next year to do any real 'celebrating.' After all, their first official performance was December 31, 1961 -- so the group really got off the ground in 1962. I got involved as their first concert (and dance) promoter in May of '63. As to their show on Friday night ... I was impressed with the overall performance even though several band members were featured on some of their hits. John Stamos played drums and guitar -- and I was very impressed that he sang "Forever," a tribute to Dennis Wilson, who had written the song and recorded it on the group's 1970 album, "Sunflower," in my opinion one of the more elusive -- but outstanding albums of the group's enormous musical legacy. John has been a fan of DW for many years and actually sang "Forever" when he married his girlfriend, played by Lori Laughlin, on the hit series "Full House." I thanked John for helping to keep the memory and legacy of Dennis alive for a whole new generation of fans. Overall, the entire band -- Scott, Tim, Randell, Mike Love's son, Christian, and John Cowsill -- did a great job and the audience was most appreciative. Like always, there were at least three generations in attendance -- proof positive that the music of Brian and The Beach Boys is here to stay. Amazing the way you keep cranking it out ... you should be making a million dollars a year with Forgotten Hits! Well, I've got to agree with you there!!! (lol) But it just ain't never gonna happen. A Brand New Forgotten Hits Book Give-Away!